1. Put sliced garlic and onions in 2 tsp olive / 1/2 tsp sesame oil warming to ML. Let cook until garlic begins edge-goldening. Prep anything else while this goes on. 2. 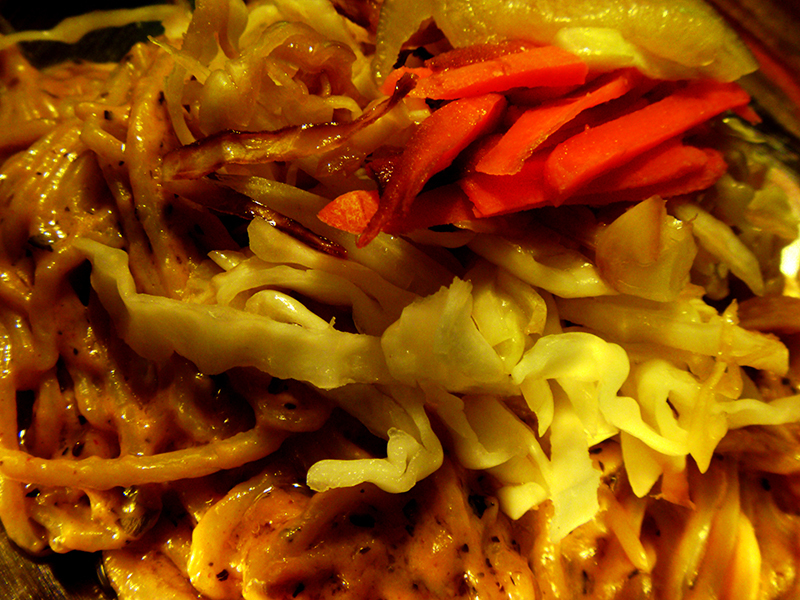 In separate pan, put remaining oil in on M. Lay cabbage and carrots in oil and toss delicately with 1 tsp soy sauce. Cover the pan and turn off the burner. Let sit until mealtime. 3. Spoon peanut butter into garlic pan and let melt. Turn up to M and throw in remaining seasonings along with gyoza sauce, coconut milk, lime juice and remaining soy sauce. Stir until the first boilin’ bubble appears, then turn burner to L.
This is as easy on the wallet as it is on your palette. Drain the can of chicken and rinse thoroughly; set aside. Cook pasta; set aside. Saute garlic in butter and oil over ML for as long as you can stand to — I went about 20m, which wasn’t tough on time since the pasta requires time to cook and the chicken needs rinsing. Turn heat up to M and stir-fry carrots and cabbage for a minute then reduce heat back to the M side of ML and add seasonings, chicken and broth. Let everything simmer while you stir in Parmesan to thicken the broth. 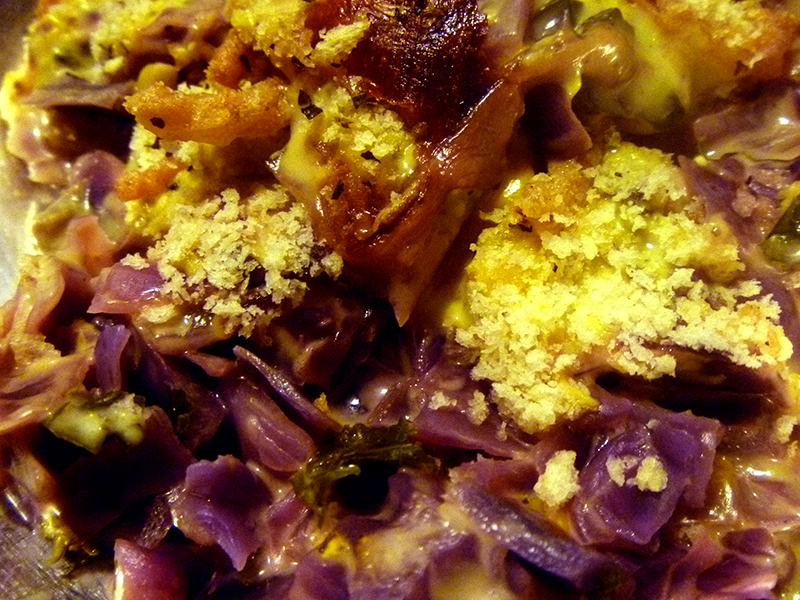 Right before serving, mix pasta with sauce/cabbage. Set aside logic and sprinkle a little Parmasean on top for 5 spoons of simplicious! Ok, so you’re going to need to do a couple of things first: blanch the kale for 5-9m (taste test it for chewability-without-suspicion) then add cabbage to the boiling water. Taste test for texture; I went about 3m. Drain everything well then line the bottom of a 8×6″ glass baking dish with the strainer contents and corn. Now that everything is done boiling, you can use the same pot to start garlic and onions in the oil/ghee. After cooking on ML for 5-10m, add the chunks of cream cheese and smoosh them all around until melted. Sprinkle on seasonings and mix in with the can of cream of mushroom soup. Pour mixture over vegetables, spreading until even. Once you’ve adorned it further with panko and french fried onions let it bake at 350° for 40m. This would have been great served over rice or alongside other dishes at a dinner table, but we ate it almost directly out of the pan. 4 spoons for not entirely knowing its consistency (5 in my heart). This is easier than the ingredient list suggests: start by emptying a can of black beans into a small pot. Add 1 tsp garlic paste, 2 tsp chili powder, 1 tsp turmeric and a dash asafoetida; bring to a low boil on MH and reduce to ML once said boil is reached. Cover, let cook for as long as it’s got liquid. I did use the food processor for a quick few pulses on the cabbage for a closer-to-slaw-without-being-too-tiny-to-care-it’s-cabbage size, and I used a cheese grater on the carrots. Come to think of it, the cheese grater might’ve been a good idea for the onion too, but today a knife did the trick. I dealt with frozen whole asparagus stems, and carefully excised 1/8-1/4″ chips from the top half of the stems. So mix all of that together. In a small sauce pan, heat oil on ML and add garlic paste. Stir until paste is one with the oil. Mix vinegar with the rest of the seasonings; once pan is hot and paste dispersed stir in vinegar mix. Pour over all the stuff you mixed together from the above paragraph and let sit at room temperature for an hour. 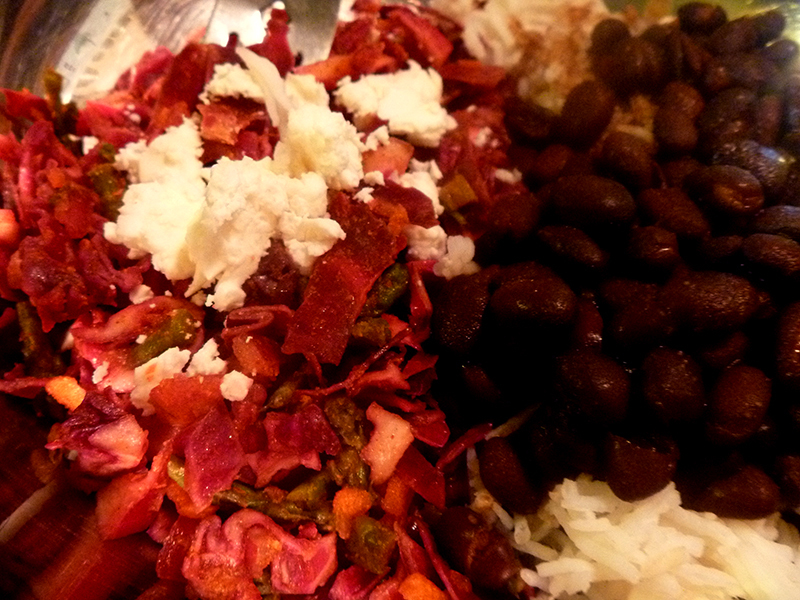 Top with your preferred quantity of feta cheese (about 1/3 c here) and serve alongside black beans over rice. These two dishes are surprisingly good together; I ended up mixing everything together and it tasted like the burrito filling you’d get at a fancy, um, burrito filling place… except with no sour cream and little cheese it was a touch less terrible for your health. 4 spoons! I spent a lifetime not liking cole slaw, but I had never had anything but mayonnaise-based cole slaws and thus considered no other slaws of which to speak. About two years ago a little place called Farm Boy’s in Chapin, SC would become the new slaw-spiration in my vastly expanding relationship with cabbage. It was easy to accept with joy the health benefits of cruciferous vegetables, and the general price of a head of cabbage means there’s almost always one in the fridge. 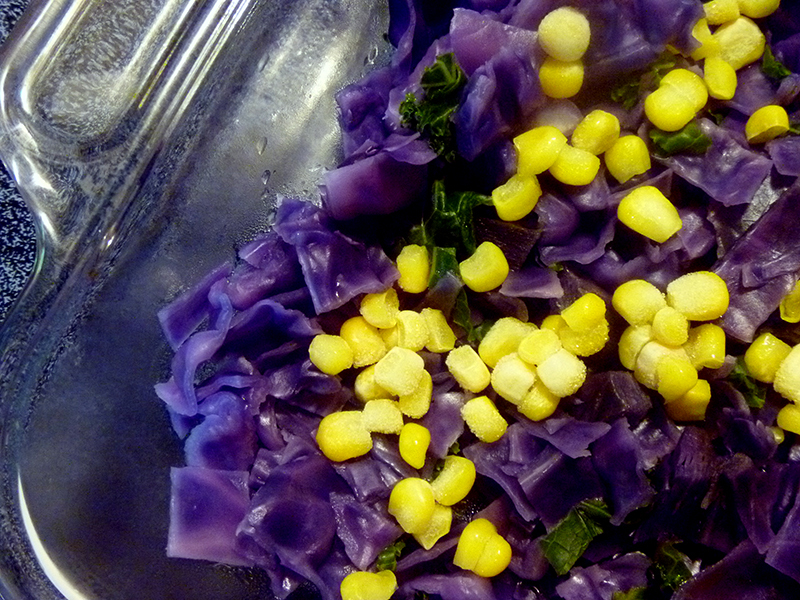 This cost:benefit ratio makes it an exciting endeavor to make an entree out of cabbage. Don’t you scoff. Start your thinly sliced garlic simmering on the L side of ML. Let it infuse while you prep other ingredients. Whisk together sugar and vinegar; set aside. When you’ve got mixed in all the solids but cheese and walnuts, increase the oil to the high end of ML. Toast walnuts with garlic for a minute or two, stirring frequently, then mix in vinegar/sugar mixture. 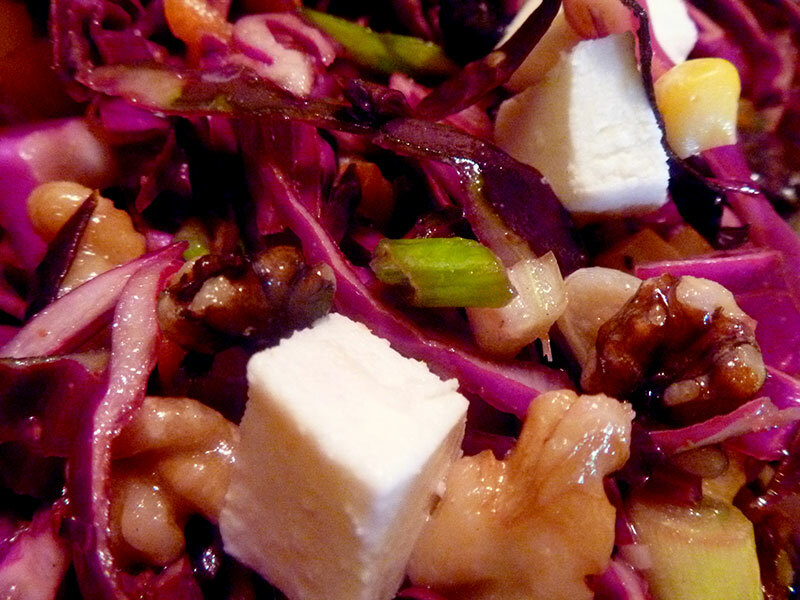 Pour warm dressing and walnuts over and into the bowl of cabbage. You can mix in the cheese now, or wait until serving time — if it sits in the vinegar it will emerge with almost a paneer-like texture. This is not necessarily a bad thing; plus it turns pink. Let the entire cabbage conundrum sit at room temperature for at least an hour before serving or chilling. I let it sit at room temperature for a couple hours before serving, then I waited a day of refrigeration before serving the rest — both ways work fine. This is going to become a meal staple as the weather begins to warm into its boil: prepare yourselves for more summer slawlads at 5 spoons! I’ve got to come clean about something. Start the ghee out on ML and when melted add the onion. Cook over ML heat for 10m or so then toss in the raw cabbage. Turn up heat to MH and stir fry for a minute or two; add 1/2 c of broth and cover. Continue letting steam over M heat for another 10 minutes. Remove lid and stir in seasonings, peanuts. Bring back to a boil and stir in moong with remainder of broth. Bring back to a boil and let cook on M until moong is tender (20-30m) and most of the liquid is gone. Remove from heat and toss in cold rice. Put back on ML heat and toss until everything is hot. Maybe this looks like it takes forever, but there were a lot of dishes to wash ‘n junk and it seemed to take no time at all (and precious little effort). As a combined nut lover and one who loves cabbage done its due, I give this 5 spoons! I am mindful that this recipe mixes some ingredients and methodologies common to very separate Asian countries. Marinate your uncut (other than extraneous fat trimming — go to town with that part while remaining true to your own taste for extraneous fat) breasts in the above mixture in a sealed plastic bag or tupperware container and let it soak overnight, or all day or any arbitrary set of several consecutive hours you like. It’ll help things along tomorrow (or later) if you go ahead and prep the other stuff, too. Nearly mince your kale and massage a drop or two of sesame oil into it; let that sit untouched for no less than fifteen minutes, and no more than a couple days (kale is hearty). Slice a thin round or two from a split cabbage* and grate some carrots; put in a baggie and into the fridge. And, really, making the broth would cut down the chicken/noodle timing issue so go ahead and do that (at least a little in) advance of the other stuff. I mean, you don’t have to do all of this the day before (although the meat would most benefit). Whenever you do make the soup, season but don’t bring it to a full boil until it’s time to boil the noodles. When it’s time to cook the chicken, preheat a pan to M/MH. When hot, spray with olive oil cooking spray and slide a shaken wedge of animal into the pan. Spoon a little of the marinade over each. Let cook (slide it around so it doesn’t stick) on that side for 2-5 minutes or until chicken shows a white-to-pink gradient when viewed from the side, flip and let the other side cook in the same fashion. Add little drops of water/marinade respectively to keep caramelization or sticking to happen. After gradient shows same range on this side, drop 1/4 c water into the pan, cover it and reduce heat to ML for 10 minutes. Now is the time to start your noodles: bring the soup to a low boil then split the ramen in half before throwing into the pot so that they fit into said pot; stir. Return to chicken (assuming the right amount of time has passed) and slice each breast as thinly as possible. Put slices back into pan and coat with the thick marinade leavings. When noodles are done, don’t drain but divide the pot contents between two large bowls. 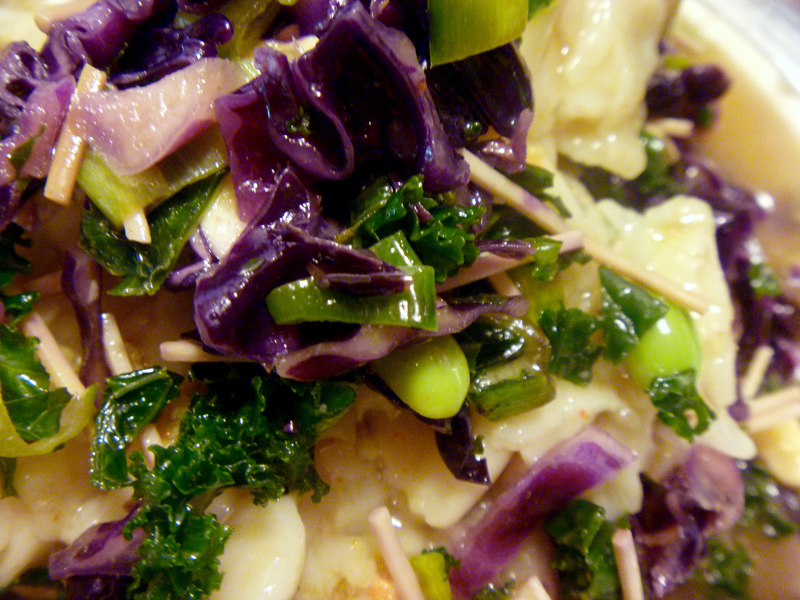 Layer on kale, cabbage, chicken and carrots. While this did end up being a little more work than for which I’ve trained myself, it delivered spicy cold weather deliciousness at 5 spoons. *All that cabbage I made the other day was divided in half, and respectively: frozen and with peas over Basmati rice at 4 spoons (that cabbage is GOOD after sitting in the fridge a day). The rest of this same head cabbage is chilling in freezer purgatory, and a smidge bit of it still lives in a tiny plastic home in the fridge. Cabbage: one if the cheapest vegetables may also be its heartiest. I have had so. much. pie. this holiday season. It really is kind of ridiculous how pies culminate for an annual winter slaughter of the human diet and pride: pecan, caramel apple cheesecake, plain cheesecake with a mandarin orange pie winning the pie-ze this year for both deliciousness and moxie. After rounding out the last family jaunt yesterday with a pizza, I feel it is safe to start officially distancing myself from rich meals and desserts that do nothing but inadvertently complicate my health and/or well-being. That being said, I made a pie for dinner tonight. Don’t you judge me. In the freezer still lived the other half of a crust two-set I’d gotten on sale, canned chicken in the cupboard and cheese in the fridge. Oh, and fresh broccoli; that’s probably the healthiest and therefore most important part of things. Before you get to arranging health around the edge of your pie, start your onion and garlic in butter heating to M. After five or so minutes of making sure everything gets coated and tossed, add the turmeric and asafoetida; stir. While that’s being perpetrated drain and rinse the can of chicken and mix your gravy packet with almond milk. Add eggs to this mixture one at a time and whisk until blended. Return to the stove and stir in 1/3 c of broth and the chicken; toss everything together and spoon into the pie crust. Add the remainder of broth to the egg/gravy mixture. Arrange chunky florets around the edges and secure it all with a pour-over of casserole gravy. Bake in a 375° oven for 45 minutes, remove to sprinkle 1/3 c cheddar over and into the florets and continue baking until a knife comes out of the middle clean. And because I made this earlier today in advance of dinnertime, when I warm it back up at 35o° for 10m I will have sprinkled on another 1/3 c cheddar. This ended up being delicious in flavor, but a little unsatisfactory to me in consistency… then again, the bottom crust I found too soggy was forked off my plate and eaten by my wife. Still, my conscience tells me to go with just 3 spoons on this. This one’s easy. Start the mustard seeds out in a ghee-oiled pot heating to M. When it’s near full heat, add the onion and garlic. When the seeds start snapping, add the spices and stir into a pasty mess. Add a dash of broth. Add cabbage in by little handfuls, all the while mixing and adding broth as needed to get everything spiced right proper. Add enough broth to cover the pan bottom, then put a lid on it and dial the heat down to the L side of ML. I cannot yet give this spoons because I do not feel it is yet a finished product. Good luck to my imagination! I just began absentmindedly cooking the cabbage in a figurative wail of disappointment over the head of broccoli I had planned on using showing unexpected rot this morning. Isn’t that the normal reaction to vegetable grief? When reality brought itself back, I was left standing before a half-sauteed head of cabbage with onion in a small pool of butter. I looked at it like a sudden, unwelcome visitor then broke away to scan the freezer. I had in all earnesty planned on another vegetarian dinner tonight, but in the back of the ice box — covered in ice itself, but not burnt — was half a turkey kielbasa. I fell back into an old recipe for safety, but modified it just enough to prove to myself that I still had it. So there’s there’s the head of cabbage, there. Toss in 1/4 c broth and cover it so it can steam on M where it’s been. 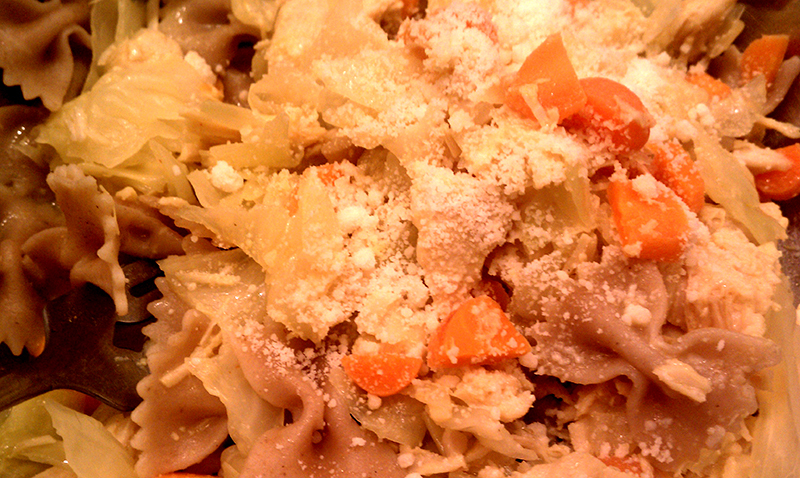 Oh, and throw in all those seasonings (especially the asafoetida — this much cabbage definitely calls for “fart powder”). 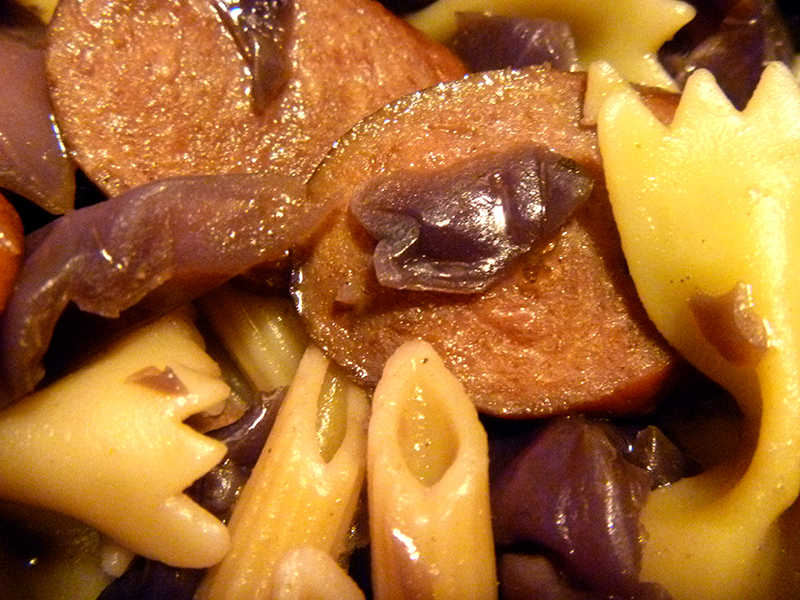 Next, brown medium-thin slices of kielbasa in the pot you’re about to boil pasta in. When the bottom of the pot (on M) starts to brown before those slices of turkeybits, scrape it up and toss the slices in those not-quite-burnt bits. Keep it together on M for another minute or two then add it to the cabbage. Bring 1/2 c of stock to a boil, then cover and reduce heat to L. Let it all simmer while you rinse out that sausage pot and ready the pasta. Cook according to instructions but make sure it’s al dente when you take it off the heat because it’s going in with the cabbage/kielbasa mix and will continue cooking. If you prefer mushier pasta (I know who some of you are, stop shielding your faces) go ahead and cook it to your preferred point. Mix everything together and top with Parmesan cheese. 4 spoons! Ok, so she’ll be home from work for the day around 3. The filling is made and chilling in a bowl. 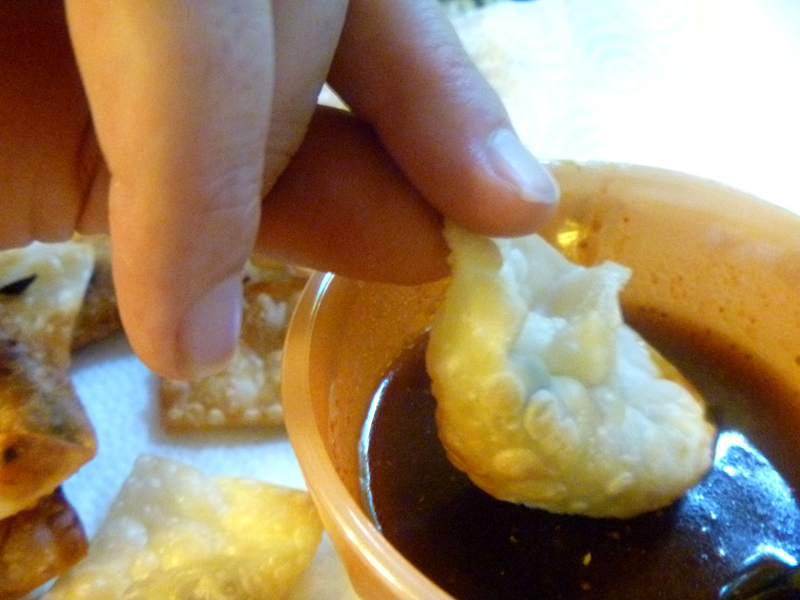 Lo, these wontons will also need a dipping sauce! The second wonton attempt ended in soggy despair, but the slaw was pretty tasty. It was saved in the fridge, hopefully, for this day. That was a labor of delicious love to which I should’ve here previously copped. The slaw would’ve gotten 4 spoons and these wontons… these wontons right here? And their sauce? 5 spoons and proud of it!